In a city so committed to its beer it was only a minor surprise to find a chocolate shop in Bamberg turning out truffles made with beer. The smoked beer truffles at Café am Dom are just the thing for the beer lover with a sweet tooth. Owner Maria Heinreich uses the rauchbier from Schlenkerla to make the truffles. They are quite sweet, but balanced out by the unique smoked beer flavor found in the soft center. Trust me when I tell you this is an experience you just cannot get in a Whitman Sampler. A visit to this Islandtown shop along Ringleinsgasse is just another reason to love Bamberg. We walked across a couple of bridges over branches of the Regnitz, admiring Bamberg’s wonderful architecture along the way, before arriving at Ambrausianum Gasthausbrauerei. Ambros Michael Mahr’s family has owned the Dominikanerstrasse location for 200 years. For a good part of that time it was rented to distillers who made schnapps. When the last distillery closed in 1955, a series of restaurants took over the location, until Mahr established a brewery in 2004. The newcomer to the Bamberg beer scene has a prime Inselstadt (Islandtown) location and is an easy place to stop as you wander Bamberg. We tried a sampler – or bierprobe --of three draughts offered at the brewpub, a helles, a wheat beer and a dark lager. While the beers were all nicely put together, it is the Beer Punch that puts Ambrausianum on the Bamberg beer map. Starting with a dark lager base and garnished with an orange slice, Ambrausianum’s Beer Punch has many of the characteristics of a mulled cider. I’d be guessing at the exact recipe, since the Mahr family keeps it a secret. At 3 Euro a cup, it certain does a good job warding off the chill of a late October night in Germany. I spent Wednesday evening with my wife, Sandy, roaming the medieval city of Bamberg, Germany. After an overnight flight from Charlotte to Frankfurt, we snacked on a bratwurst and plastic cup of fresh Bitburger Pils at the airport rail station before boarding a train that took us east to Wurzburg, where we changed to a local that deposited us in Bamberg in a light rain. Bamberg is located along the Regnitz River in the upper Franconia section of Bavaria, at a major crossroads for traditional trade routes. Named a UNESCO World Heritage Site in 1993, Bamberg has nine breweries to serve the needs of 70,000 inhabitants. The brewing tradition runs deep in the city. While the Reinheitsgobot (German Beer Purity Law of 1516) gets most of the press, the Bamberg Beer Purity Law of 1489 was actually the first to dictate that only hops, malt and water could be used in brewing. Prince Bishop Henry III Gross of Trockau had become frustrated by the use of herbs, berries and even mushrooms in the making of beer and decided to make a stand. Bamberg’s place as a brewing center was established. Obere Konigstrasse, where our hotel was located, was one of the main routes for thirsty trades in the Middle Ages and was once home for 23 breweries. The street’s brewing heritage is kept alive today by Baruerei Fassla and Brauerei Spezial, located just across the street. After a brief break to freshen up at our hotel – Brauereigasthof Fassla (more on this brewery hotel later) -- we met up with Bamberg guide Stephanie Weiss. Our first stop on our beer tour of Bamberg was the Spezial Brewery, which dates back to 1536. All of the breweries we visited in Bamberg have good restaurants serving hearty German meals. If you visit during a time when the kitchen is closed, each will usually have fresh pretzels and bread available -- or you can buy a sandwich from a nearby shop and bring it in to enjoy. At Spezial we got our first taste of fresh Rauchbier, a Bamberg specialty. Rauchbier – or smoked beer – gets its name from how the barley malt is dried using direct heat from beechwood fires. The smoke from the wood marries with the grain and shows through in the beer. If you wonder what beers tasted like before the mid-1800s, you can search for clues in a glass filled with a smoked beer. The smoked beer at Spezial is a nice amber brown color. The smoked flavor is more subtle than I expected. It is certainly present, but it is more a part of the flavor than the flavor. Spezial Rauchbier has a nice soft malty character and leads you to think of having a second, but we had places to go and beers to try. As most of the regular readers of this blog know, I was diagnosed with prostate cancer earlier this year and had successful surgery in April. I discovered the disease because a friend who is fighting prostate cancer urged me to get a PSA test. As a result, I caught the illness early and had successful treatment. Pints for Prostates is my attempt to reach more guys through the universal language of beer and urge them to get tested. The program has now been around for about five months and thanks to many of you, the word is spreading. If you visit www.ustoo.org/pints you can catch up on some of the things we've been doing and some of the generous folks that have been helping us out along the way. We've had more than 50 blogs and websites run the Pints for Prostates banner, skyscraper and badge ads, plus many have run stories, too. Magazines have run articles and donated advertising space. We've had folks give us booth space to appear at beer festivals in Colorado, North Carolina and Texas. 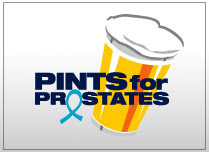 First and foremost, Pints for Prostates is an awareness campaign. So far we estimate that more than 25 million people have been exposed to the message! While we are not a fundraising campaign, we have accepted donations along the way. All of the funds raised during the Pints for Prostates campaign go directly to bolster the efforts of Us TOO International, a great 501(c)3 charity with the mission to support, educate and advocate for men with prostate cancer and their families. I want to thank everyone who made a donation to the ChipIn campaign run on Lyke2Drink. The effort raised $215, which I then matched, so Us TOO received a check from Lyke2Drink for $430! (You can still get in on the act by supporting the campaign launched by the 270 or so members of the Aleuminati community. There is a ChipIn widget on their site and to the right of this post). So thanks for all of the help getting this campaign up and going. We are going to continue to work on spreading the word and we invite any brewers who wish to join the cause to contact us. And, if you have a man in your life who is 40 years old or older, tell him to make a medical appointment and get tested. The more men we reach with this message, the more lives that will be saved. Tuesday Tasting is a regular feature of Lyke2Drink that explores some of the best beers, wines and spirits on the market. This week we taste a dozen Syrah and Shiraz wines. Syrah or Shiraz is a bit of a mystery to some wine drinkers. After all, it is the same grape, but produces wines that go by two names. There is another grape called Petite Sirah, that is a cousin, but not the same grape -- which adds to the mystery. Where the wine comes from helps determine what the wine is called. If it is from France, it is syrah. Winemakers in South America and the rest of Europe will also use syrah on the label. If it is from Australia, you are drinking shiraz, mate. Shiraz is the most popular grape for winemaking in Australia and vineyards in South Africa and New Zealand are likely to use the shiraz name on their labels, too. In California, you could be drinking either – it depends on the winery. Most of the rest of the U.S. appears happy to side with the French and use syrah. I recently tasted these wines for my Beyond Beer column appearing in the current edition of All About Beer magazine. Ty Caton 2004 Field Blend: A mix of petite sirah, syrah, cabernet sauvignon, merlot and malbec grapes, this is an affordable luxury with great meritage blended quality that hits all of the Sonoma red flavor characteristics of a more expensive wine. Clos Du Bois 2005 North Coast Shiraz: This California red has an inviting nose. The coating blackberry flavor has a light spice finish. D’Arenberg 2002 Vintage Fortified Shiraz: A thick and syrupy Port-style wine, this dessert treat is from South Australia. Very deep purple color, good berry character and a touch of cocoa flavor. Fetzer Valley Oaks 2005 Shiraz: There is a touch of oak and spice throughout this wine. Plum skins and ripe berries mingle to create an inviting flavor. Hall 2005 Darwin: This Napa Valley wine is a symphony of rich flavors. A blend of 80 percent syrah grapes with 20 percent cabernet sauvignon. Lush and smooth, very intense fruit that lingers. Starts with a hint of fig and finishes with a wisp of chocolate. Fire up the grill and cook a thick steak. Terry Hoage Vineyards 2005 The Hedge Syrah: A former Georgia Bulldog football star, Terry Hoage makes wine in Paso Robles, Calif. This deep red 100 percent Syrah wine is rich and round. Plenty of berries, black cherries with a touch of cigar-like tannins. Jaboulet 2006 Parallele 45: This Cotes du Rhone red has a nice amount of tannins and some peppery spice. Nice light berry nose. Loxton 2004 Sonoma Syrah: This wine spends 20 months on oak and produces a bold, fruit forward red that delivers a long pleasant flavor profile. Virgin Vines 2006 Shiraz: This California wine is ruby red with a cassis nose and dried berry flavor that finishes with just a hint of spice. Wakefield 2005 Promised Land: This Australian wine is 60 percent shiraz and 40 percent cabernet sauvignon. Ripe blackberry nose, straightforward fruit flavor that is rounded out with a hint of cinnamon, spice and oak. Wyndham Bin 555 Shiraz: This southeast Australian wine is rich and smooth with hints of plum, blueberry jam and a touch of finishing spice. Wyndham Shaw Reserve 2004 Shiraz: Rich, dry red. There is a moderate amount of oak throughout that balances a solid level of rich, tart fruit. A couple of weeks ago my brother-in-law Dan Pikarsky showed me an amusing little application on his iPhone. Basically it was a cyber beer. When you activate the feature, the phone's screen appears to be a full glass of beer. Tip the phone toward your lips and it appears you are drinking the brew. Created by Steve Sheraton, this bit of web fun can be downloaded -- at $2.99 a pop. That's around the cost of a real glass of mainstream domestic suds in many taverns. Now the software developer wants real beer maker Molson Coors to cough up $12.5 million. Sheraton alleges that's the tab for lost sales caused by iPint, a promotion the brewer launched for Carling Lager in the United Kingdom. Sheraton is alleging that iPint has committed copyright infringement. He says Molson Coors use of the virtual beer to advertise Carling is hurting sales of the original iBeer. He points to sales trends that show a decline in iBeer business since iPint has been available for free to anyone willing to view a Carling commercial on the Internet. The suit alleges iPint has been downloaded 6 million times. Sheraton claims Molson Coors had contacted him about using iBeer for the campaign, but he refused the offer. Molson Coors said it fight the lawsuit in court. Whiskey barrel aged beers were not hard to find in Denver last weekend at the GABF. Now London's Fuller Smith & Turner is showing its love of wood by releasing a beer aged in Scotch barrels. Fuller's Brewer’s Reserve is a 7.7 percent alcohol by volume beer that spent more than 500 days in barrels that previous had been used to age an undisclosed 30-year-old Scotch. Fuller's said the brew was a four year project and that 25,000 individually numbered bottles will be sold. The company had to convince British Customs officials to tax the new brew at the beer rate and not the higher levy charged for whisky. Fuller's plans to use the Brewer's Reserve label for annual releases of limited edition beers. Well, I managed to survive another Great American Beer Festival. This one was my fifth going back to 1993. I know this because on my beer festival t-shirt collection, which tends to be a pretty accurate metric for most of my beer tourism. There were plenty of interesting things to take away from the 27th GABF besides just t-shirts. Here are some not so random thoughts still fresh in my mind from the event. Consumer support for craft beer continues to be extremely strong even in these tough economic times. You can measure it in several ways, but the clearest view is from statistics released by the Brewers Association with year to date 2008 estimated growth indicating all beer is up a slim 0.4 percent, imports are down 2.9 percent, but craft beer is up 6.5 percent. Even when compared to wine, up just 0.5 percent, and spirits, up 1.8 percent, craft beer rules when it comes to growth. The brewing community continues to be extremely creative and focused on quality. My favorite beers from the festival floor and from four days and nights around Denver are a pretty eclectic mix: Ram Total Disorder Porter, Breckenridge Agave Wheat, Great Lakes Rackhouse Ale, Bluegrass Knob Smoker, McCoy's Oliver's Potato Pale Ale, Samuel Adams Chocolate Bock, Flying Dog Dog Schwarz, Stone Brewing 12th Anniversary Chocolate Stout, Port Brewing Hop 15, Double Mountain Hop Lava, Freestate Maibock, 21st Amendment Bitter American, Cascade Kriek Ale, Alaskan Smoked Porter, New Glarus Wisconsin Red, Foothills Sexual Chocolate, Pizza Port Night Rider Imperial Stout and Great Dane Old Scratch Barley Wine. The number of consumer magazines focused on beer and attending the GABF grows each year. All About Beer holds the position as being the oldest and it has been joined over the years by respected publications such as the Celebrator, the Brewing News chain of regional beer papers, Ale Street News and other regional publications such as Beer Northwest. Home brew and trade publications like Zymurgy, American Brewer and Brew fill a niche for homebrew enthusiasts and professionals. Add to the mix relative new comers that have a strong presence, including DRAFT, Beer and Imbibe, and it appears the public has a growing thirst for beer coverage. But traditional media is just one area of growth. This blog and scores of others cover beer news big and small. Podcasts and streaming video beer newscasts are popping up across the web. There is no lack of beer news for thirsty consumers. It was nice to hear that fellow beer journalist Lew Bryson was honored with the 2008 Michael Jackson Beer Journalism Award for trade and specialty beer media. He was joined in receiving the award, sponsored by Brooklyn Brewery, Rogue Ales and Samuel Adams, by Mark Marion in the consumer electronic media category and Adem Tepedelen in the consumer print category. Lew is a good guy -- I'm sure Mark and Adem are, too, I just don't know them -- and it is always nice to see someone like Mr. Bryson pick up an award for their good work. You never know who you may run into at the GABF. I was able to say hello to a bunch of folks this year, including brewers Eric Beck of Anheuser-Busch, Garrett Oliver of Brooklyn Brewing, Teri Fahrendorf, creator of the Pink Boots Society, Jim Koch of the Boston Beer Co., T.L. Adkisson of Ham's Restaurant & Brewhouse, Don Barkley of Napa Smith Brewery, Jamie Bartholomaus of Foothills Brewing and many others. A personal highlight was getting the chance to chat with Zane Lamprey of Three Sheets television fame. Lamprey, who like me was born and grew up in Syracuse, was in the DRAFT magazine booth on Saturday night meeting fans. When he heard we shared the same hometown, Lamprey broke into song -- the 1970s-era radio jingle for Camillus Mall -- and happily agreed to slap on a Pints for Prostates sticker for the evening. Often when you meet a celebrity they don't live up to their image. In Zane's case, I'd happily spend an evening with him chasing down local drinking hot spots. Most people I spoke with agreed that the crowds at this year's event felt a little too large for comfort. The Brewers Association increased the attendance by 5,000 people in 2007 to 46,000 and soldout two weeks in advance at that number of tickets again this year. Keep in mind that back in 2005, the attendance at the event was 29,500. India Pale Ale is a beer style you'll find at most microbreweries and brewpubs across this country. American-style IPA was once again the most commonly entered beer in the GABF competition, with 104 brewers chasing medal glory. Union Jack IPA from California's Firestone Walker Brewing took the gold. 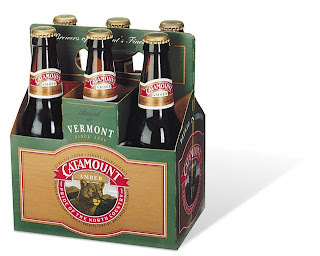 The Gluten-Free Beer category, with just 10 entries, had the fewest. Redbridge from Anheuser-Busch won the gold. Alaskan Smoked Porter already held the honor as being the most awarded beer in the competition since the professional judging panel started handing out medals in 1987. The beer had 15 going into the Saturday awards ceremony and actually came away with an amazing two medals this year -- a gold in the Aged Beer category for the 2006 vintage and a silver in the Smoke-Flavored Beer category for the 2007 version of the beer. I owe a big thank you to the people at DRAFT magazine, particularly Austin Wilson and Erika Rietz, for allowing Pints for Prostates to take over a corner of the magazine's busy booth. Working with Pam Barrett of Us TOO and with some well-timed support from Barron Boyd, we were able to talk to hundreds of festival attendees across the four sessions. In addition to spreading the word about the importance of early detection in fighting prostate cancer, we raised nearly $1,000 to help fund the mission of Us TOO International. It was great to meet a number of fellow prostate cancer survivors and hear from so many people who had already seen our ads and articles in beer publications. Hopefully, they will all stick to their pledge and make an appointment for a check up and a PSA test. Boston Beer Co. hosted a brunch on Saturday in Denver to announce that Alex Drobshoff of California is the winner of the 2008 Samuel Adams Homebrew Contest and the Carissa Sweigart won its employee brewing contest. Drobshoff's Traditional Bock and Sweigart's Cranberry Wit will be featured along with Mike McDole's Double IPA in the new LongShot six pack. McDole won last year, but due to the worldwide hop shortage production of the hop-intensive beer was delayed. More than 1,300 consumer entries were received for the homebrew contest. The new LongShot six packs will hit store shelves in April. Boston Beer founder Jim Koch supports the program because he first brewed Samuel Adams Boston Lager in his kitchen in 1984 and believes homebrewing is an important part of beer appreciation in America. The 27th edition of the Great American Beer Festival ended a few minutes ago. Earlier today the Brewers Association handed out 222 medals for beers entered in 75 style categories. Also awards were given out for the small, medium and large breweries and small and large brewpubs of the year. Mid-Size Brewing Company and Mid-Size Brewing Company Brewer of the Year: Sponsored by Crosby & Baker Ltd.
Small Brewpub and Small Brewpub Brewer of the Year: Sponsored by Briess Malt & Ingredients Co. Shortly after 1 p.m. today in Denver they will start calling names and handing out Great American Beer Festival medals. These sought after awards will be given out for beers in 75 different categories. A total of 477 breweries from across America entered 2,961 beers in search of GABF fame. The judging took place this week over three days at the Marriott Hotel with 127 judges from 11 countries laboring to pick the best beers in America. If you do not have a ticket for the afternoon connoisseur's session, you can check out live video and audio feeds of the event provided by the Brewing Network. Lyke2Drink will post the winners list as soon as the Brewers Association makes an electronic version available. A Friday tradition at the Great American Beer Festival is an event called the "Alpha King Challenge." Held in the basement of the Falling Rock Tap House, this event has no formal standing with the Brewers Association, but it attracts serious attention from hop bomb brewers who want to one up the competition when it comes to IBUs. In the 10th Alpha King Challenge, Port Brewing's Hop 15 captured the glory, beat about 75 competitors from around the country. Hop 15 also won the title back in 2004 and becomes the second beer to have taken the crown twice. The event is co-sponsored by Hopunion LLC, Brewing News & Three Floyds Brewing Co. The Alpha King Challenge is designed to recognize beers that are extremely hoppy, yet show balance. No barley wines are allowed in the competition and beers should be 60 IBUs or above. 2007: Pliny the Elder Double IPA, Russian River Brewing Co.
2006: Boundary Bay Imperial IPA, Boundary Bay Brewing Co.
2003: Deuce Imperial IPA, El Toro Brewing Co.
2002: Moylander Double IPA, Moylan's Brewing Co.
2001: Moylander Double IPA, Moylan's Brewing Co.
2000: Sockeye Red IPA, Midnight Sun Brewing Co.
1999: Two Hearted Ale, Bell's Brewing Co.
During the last few weeks I have been plowing through the records of the Brewers Association covering the hundreds of medals that have been presented since 1987. With a huge assist from my son-in-law, Mike Wirth, we took the data and tried to visualize the history and growth of craft brewing through the eye of the professional judging panels. 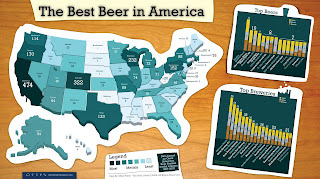 Looking at the pages of medal winners from the past does not give quite as clear a picture as the state map showing where the winners come from and the charts indicating the dominant beers and brewers. This year's GABF sold out more than two weeks ago. Some 2,600 volunteers are helping serve 1,967 beers from 432 breweries on the floor of the Colorado Convention Center. Behind the scenes at the Marriott Hotel, 127 judges from 11 countries have been judging 2,961 beers from 477 breweries in 75 categories. Over the years these medals have become a yard stick for comparing one brewery to another. In looking at the statistic from the previous judging competitions, clearly beer fans in California, Colorado, Wisconsin, Oregon and Pennsylvania enjoy some of the best beers in the land. The top medal winning brewers range from the very largest to some of the fastest growing craft brewers. The top honored beer in the history of the history of the Great American Beer Festival is Alaskan Smoked Porter, with 15 medals. New Belgium Abbey Belgian Style Ale and Genesee Cream Ale have both captured 10 medals, while Samuel Adams Double Bock has received 9 medals. Medals are not the end all and be all to finding a great beer, but the GABF competition has given beer fans a way of knowing about the quality of a beer before they spend their hard earned money. It has also given the marketing departments at brewers across the country something to talk about. The Brewers Association continues to add entertainment elements to the Great American Beer Festival. One of the new features this year is something called "Win Beer Stein's Money," a trivia game show hosted by Tom Daldorf, publisher of Celebrator Beer News. Think you know beer trivia? Win Beer Stein's Money pits festival attendees in a fast paced competition. Plenty of useless facts for sure, but knowing obscure beer facts just might win you a beer at your favorite pub. Thanks to the good folks at DRAFT magazine who donated a corner of their busy booth at the Great American Beer Festival, festival goers are getting the chance to learn more about prostate cancer, the importance of PSA testing and regular check ups. Pam Barrett from Us TOO International came to Denver from Chicago to work the table. Beer fans stopped by Thursday night to ask questions, pick up literature and donate to the cause. If you are attending the event over the next couple of days you can find us in section J among the Midwest breweries along one side of the massive hall. Before heading over to the Colorado Convention Center for the first GABF session we stopped at the Hyatt Hotel for a reception hosted by Michelob Brewing Co. The good folks from St. Louis are busy creating a separate identity for their brands. This shrimp-filled reception on the 27th floor of the hotel overlook the Denver skyline is part of the process. The brewers at Michelob have been busy. The Michelob Dunkel Weisse has been chronicled here before. At this event I tried four of their beers. There was a rather average Marzen, a malty Porter and two experimental beers. The "Koelsch" was crisp and clean, but the surprise came in the form of a bottle with a white label with the words "Bride of Tomahop." When this beer was poured something made a noticable "plop" in the glass. The aroma of fresh hops was clear and soon a full hop cone floated to the top of the brew. I doubt this beer will see a commercial release anytime soon, but I found it refreshing that Michelob would even bring it to Denver to share with beer writers. Great Divide Brewing Company’s annual GABF kick off lunch was a jam-packed affair. Tons of brewers from across the country mixed with beer writers and other industry hangers on. It is one of the events that makes you realize that the actual festival portion of the long GABF weekend is only a small part of why the beer community descends on Denver each fall. As usual, Great Divide had its full line-up of impressive beers on tap for sampling, along with a sandwich and sausage buffet that included some great cheeses. The Titan IPA has a crisp and pronounced hop flavor profile, which was only outdone by Great Divide’s Fresh Hop Ale, which features the aroma of fresh hops flown into Denver right after picking in Washington state. Wandering around the brewery I found my way into the cold warehouse section where samples of two beers that had been aged in Stranahan’s Colorado Whiskey barrels were being poured for lucky guests. It was at this exact moment that good friend Barron Boyd from Syracuse, N.Y., arrived on the scene. We got a healthy sample of the Old Ruffian Barley Wine that had been finished in the ex-whiskey barrels. It was a lively drink with clear notes of the whiskey from the oak breaking through the hop character. Another unexpected treat on tables at the Great Divide were bags of wonderful malted milk balls from Briess’ Malting Co. Some “in the know” folks confessed that they were addicted to them. I think I may have joined the ranks of the people who jones for this candy. The Great American Beer Festival kicked off yesterday in Denver, Colo. Before the official ribbon cutting there was a flurry of activity around town as brewers tried to snare the attention of the assembled beer press corps. Things kicked off pretty early, with an event at 11 a.m. hosted by promoters of San Francisco Beer Week at the Falling Rock Tap House. San Francisco Beer Week will take place Feb. 6-15, 2009. Calling itself “America’s Original Craft Beer-Drinking City,” San Francisco is working to grab its share of the beer tourism market. Other “Beer Weeks” – most notably in Philadelphia – are popping up around the country as brewers and local economic development officials recognize the spending power of beer drinkers. San Francisco Beer Week will feature more than 100 different events, including the Bistro Double IPA Festival, the Toronado Barleywine Festival and a museum exhibition looking at the history of brewing in the city and northern California. 21st Amendment Bitter American: This might just be the ultimate session beer. You would never know that it is just 2.9 percent alcohol by volume, with its herbal hop nose, fluffy head and long lasting flavor that ends with just the amount of dryness to encourage another sip. Magnolia Brewing Rosebud: This 7 percent brew starts off with an English grain bill and Belgian yeast, but takes a left turn along the way with poppy pedals, rose buds, monks pepper and the juice of 100 pounds of syrah grapes in a seven barrel batch. This is one of those beers that reaches your palate from several different directions, making it hard to give an accurate description of the taste. The wine is clear in one sip and then the floral and spice characteristics come through in the next. Drakes Imperial Stout Experimental Beer: This thick, black brew put an exclamation point on this mini San Francisco tasting. Aged for five years in a port barrel, with whole blueberries added along the way, this beer was loaded with flavor notes that had hints of sourness and wine. Obviously a high octane beer, no one was aware of the exact ABV, but we agreed it was likely north of 10 percent. In the Marriott Hotel a few blocks from where I'm staying in Denver around 100 hardy souls are starting day two of an important task: they are judges for the Great American Beer Festival competition. While this might sound like a job you would like to have, it does come with a heavy workload, deadlines and a good amount of responsibility. The judges -- brewers, journalists and industry members -- meet in panels for the better part of three days, carving down hundreds of entries in dozens of categories to hand out gold, silver and bronze medals. The GABF went to a professional judging system in 1987. Before that, a consumer preference poll determined the award winners. Since that time thousands of medals have been handed out to brewers. These are valued for their marketing power and the bragging rights that come with them. In the 21 competitions judged under this system, the panels have deliberated over the beers and occasionally decided not to award a certain medal in a category. This has happened just 25 times in the history of the GABF. More common is the phoenominon of the "one hit wonder" -- a brewery that wins just a single GABF medal. The list is a long one and shows just how tough it is to win at the GABF. Some of the breweries have gone out of business, others may have stopped sending beers to Denver for judging. Others are still trying to capture a second gold, silver or bronze. Here's a snap shot by year of just some of the nearly 190 GABF "one hit wonders." The Great American Beer Festival is set to go in Denver. Even before the first session kicks off on Thursday at 5:30 p.m. the town is buzzing with brewers, beer fans and talk of great beer. I arrived in the Mile High City earlier today. I had to catch up on some blogging and other work before heading out for a beer and dinner. I decided to make my first stop the Falling Rock Tap House on Blake Street. The Falling Rock is one of those places where you can always find someone you know during the GABF. It is the unofficial headquarters for many people attending the festival. You can check out the crowds by visiting www.fallingrocktaphouse.com and checking out the web cam. It was not long before I ran into Jake Norris, the distiller at nearby Stranahan's Colorado Whiskey. Before I could slip out I ran into Julie Johnson Bradford and Amy Dalton from All About Beer. It was not long before Daniel Bradford from All About Beer, beer writer Jay Brooks, publican Don Younger from the Horse Brass in Portland, Ore., Brooklyn Brewery's Garrett Oliver, author Maureen Ogle and San Francisco beer chef Bruce Paton arrived, along with dozens of others from the industry. It felt like the Falling Rock was as good a place as any to spend the evening. I ended up having a pretty eclectic mix of brews. Lost Abbey Witches Wit was light, yet flavorful. The beer had a slightly fruity upfront taste. It was a good start to a couple of great hours of beer. My next selection was Big Sky Moose Drool Brown. I had not had this beer in several years and found it to be as good as I remembered it. The beer was malty and fresh with good depth. Port Brewing's Old Viscosity Ale ("Not Your Dad's 30 Weight") was shared around the table. At 10 percent alcohol by volume this beer was coating and thick. It had a slight roasted quality and a pungent kick. Just before departing the staff at Falling Rock announced some special brews had just arrived from Colorado's Avery Brewing, a long time favorite of mine. I decided to try the Avery Reverend Eagle Rare Ale, which was aged in barrels that once held Eagle Rare Bourbon. This was an interesting beer that had hints of grapefruit and apricot skin. It was a bright yellow color. I did not get the sense of Bourbon that you usually find with brews that spend time in whiskey barrels. In fact, my original reaction was the beer might have been aged in a chenin blanc or gewurztraminer barrel. The real fun of GABF starts tomorrow with a number of special events and the opening session. Look for updates throughout the weekend. Do you recall how tired you felt after throwing that last party for a few family members and friends? There was the shopping, the set up, preparing the food, getting the beer on ice, making sure there was music and when it was all done it was time to clean up. Hopefully, along the way you were able to enjoy the fruits of all of your hard work. Now imagine for a moment that your little event was actually held in two four hour sessions, in an outdoor stadium and attended by some 8,000 people, many of whom lined up outside for an hour or two before the start of the party. Now you get the idea of how the folks at All About Beer feel heading into each edition of the World Beer Festival. I have to say they truly have things down pretty well, thanks to a dedicated staff and some hard working volunteers. I had to show up a little early this year to get the Pints for Prostates booth set up and I found Julie Johnson Bradford, Daniel Bradford, Gregg Glaser and Amy Dalton already hard at work. 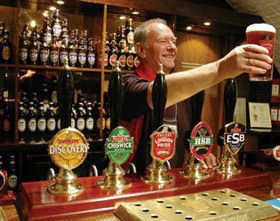 One of the key elements of any successful beer festival is the head of the event staff and the leader of the brew crew. These are basically the folks that make this sort of event run. If people attending the event have a good time, they have these folks to thank. In the case of the World Beer Festival, Ola Nilbrink is the Events & Operations Manager, while Keith Klemp runs the Brew Crew. Just watching all of the volunteers unload and deliver beer on the morning of the festival made me a little thirsty. Without this army of workers, there would be no way to hold a festival of this size.